What's New? by Tim Finkle: We've been traveling quite a bit as of late and finally back in the office today to write some of this stuff down! Two weeks ago I was in Austin TX for the Sail America Conference that happens every two years. I really enjoy going to these meetings, not only for the great presentations and content, but also to meet and talk with many others in the industry. We all have different experiences but similar businesses and we can share thoughts and ideas. The conference had companies from all over in many parts of the sailing world - boat builders, parts suppliers, magazine publishers, dealers, sailing schools, retail companies, engine builders, insurance companies, etc. You had the opportunity to hear from so many people and talk to them face to face. 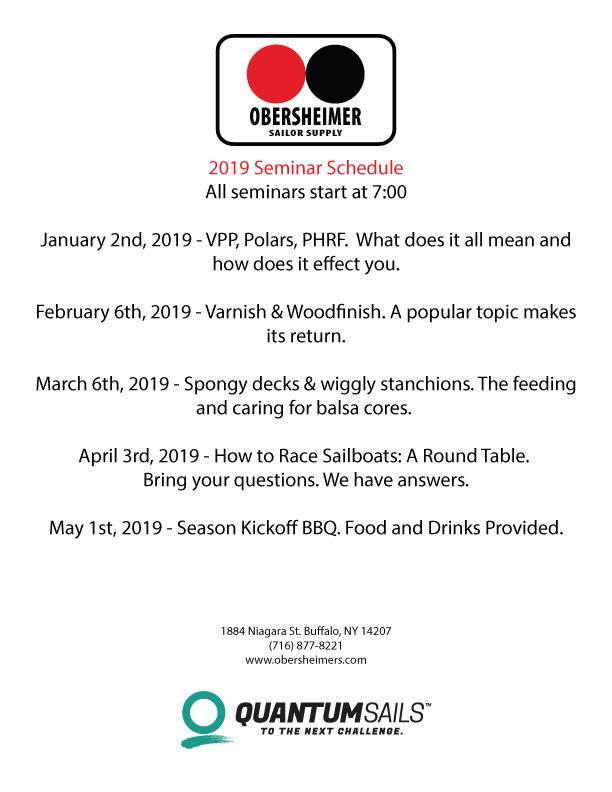 We had presentations on state of the industry, America's Cup, marketing trends, sales training, HR training, and several other topics and panel discussions. I look forward to the next one, but first trying to implement some of the best practices here at RCR! This week, Don was in Annapolis for Beneteau dealer meetings and I was in Rhode Island for JBoats dealer meetings. At the J meeting, we were introduced to the new J/99, first time any of us had laid eyes on her. There was a J112E right next to it, sold and going off to the midwest this spring. We were very impressed with the boats, both built in France at J Composites. Both boats are shipped over by water and then keels and rudders are put on at International Marine in Bristol RI. From there, some have other work like bottom jobs, hull paint, electronics, and other option installs. We have J/99 #11 coming in May that is for sale and then a J112E #47, coming in June that is pre-sold. Christmas in July, by Don Finkle: Who doesn't like exciting new presents that you get to open, and one of ours is coming this July. 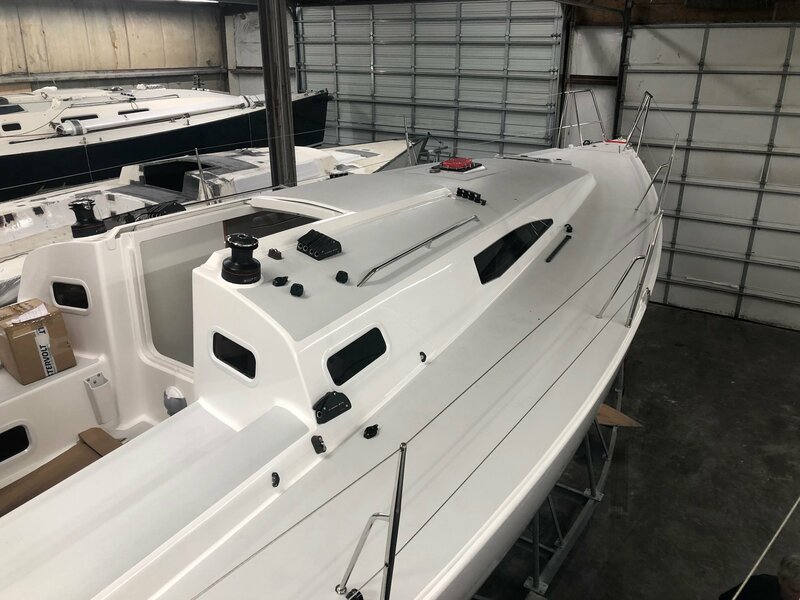 We are speaking of the all-new Beneteau Oceanis 30.1 that combines a slew of new features and design elements that are not typically found in a boat of this size. Frankly it is going to be hard to wait until our first boat shows up. 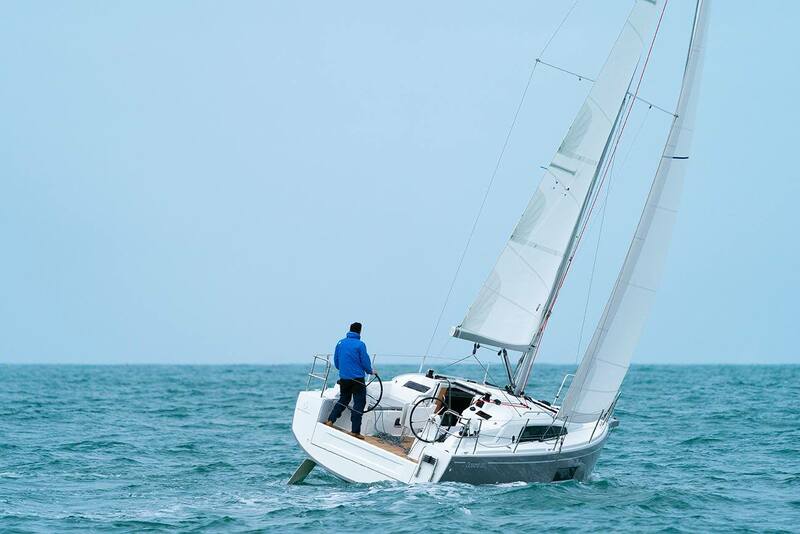 The hull shape is derived from the latest thinking embodied in the newest and largest Beneteau models, with a full length hull chine for space in the ends, stability and bouyancy. The cockpit is where most of your time is spent on a boat of 30 feet and extra emphasis was placed on that aspect of the boat. You can have a tiller or twin wheels, a choice of four different keels, standard square top mainsail or in-mast main furling. The standard jib is self-tacking but our boat is coming with a genoa and winches by the helm. We have set it up for maximum performance potential with Code O, square top main and the genoa. Because we have enjoyed the twin wheel boats we have been sailing over the last few years so much we are going with the wheels. People ask why twin wheels on a boat of this size? The best way to answer that is once you have sailed a boat with twins you will understand right away. The cockpit is more open, the visibility forward much better, you have more positions to helm from, you can better place your weight as a driver, and it makes for much better access to the swim platform. We are talking about the exterior, but the interior sports features you will not find elsewhere in this size range. There are two large double-berth cabins in the bow and aft, courtesy of the hull shape that provides more beam in the ends of the boat. A large head with shower, functional galley, and two full length settees are all there. This is all possible due to the hull shape. Before you think this boat is a tub keep in mind it is narrower so as to reduce drag and helm when the boat heels. When we get our boat we plan to demonstrate it extensively so you can see for yourself. How do we know the boat is as good as they say it is? Because dealer friends of ours who saw the boat in its recent debut in Europe rave about it. Limited Available Stock! 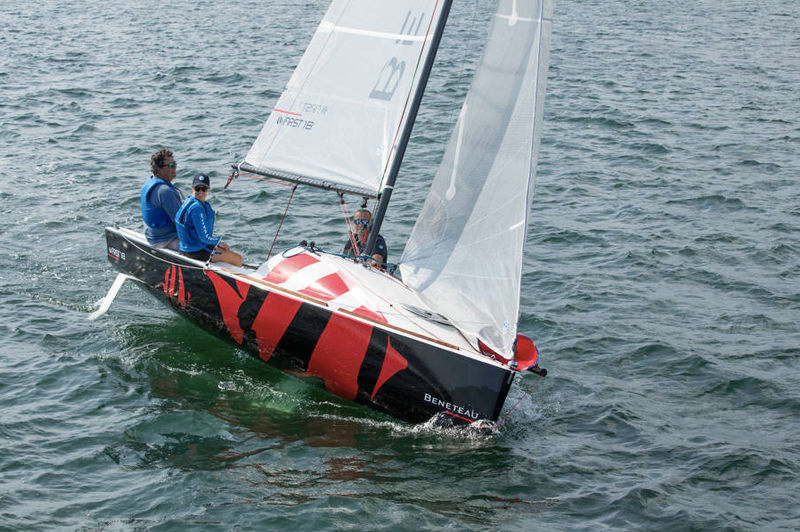 : Between the J/99, Beneteau First 18 and Oceanis 30.1, we are limited to one boat for all of 2019. If you are interested in any of these new designs, please make sure we are aware of your interest! Winter Projects: We have many projects to tackle in the winter months. Some days we can go outside, most days we can't! 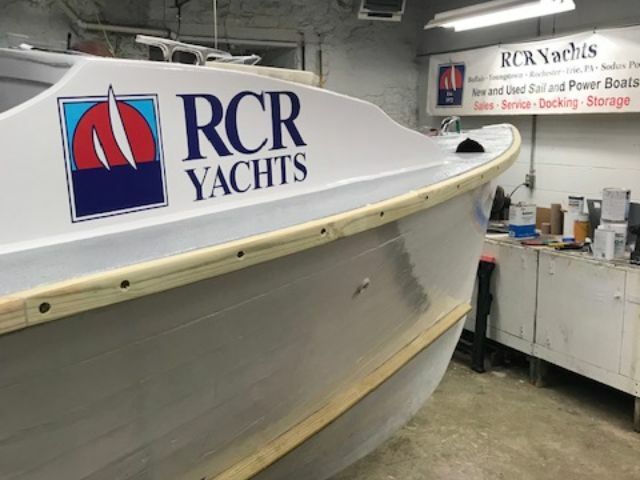 The crew of Jim Egloff, John Bailey and Nick Egloff in Youngstown have rebuilt the hull of our 1950-something wooden work boat, re-painted, new electrical, and even an RCR decal. This has been our work horse for 40 years as we tug moorings around the Niagara River. Good job guys! It is not done and when it is, I will have Jim tells us all about what they did and we will share with readers. Boat Partnership Presentation: We had a nice presentation that was organized by the tireless Diana Augspurger. She gave a speech on how to properly enter and execute a boat partnership, as she does with her J/33. Rick Lenard of RCR gave an outline of what is needed to purchase, service, dock and store a boat in Buffalo. It was a very informational event. If you missed it, please don't hesitate to call and ask how you and friends can get into this type of ownership. THE RESPONSE TO THIS EVENT HAS BEEN OFF THE CHARTS SO PLEASE LET US KNOW YOU'RE COMING SO WE ARE WELL PREPARED FOR YOU. SEE YOU IN JUNE. RCR Staff Cell Phones - Give us a call!